Huge Savings Item! Free Shipping Included! 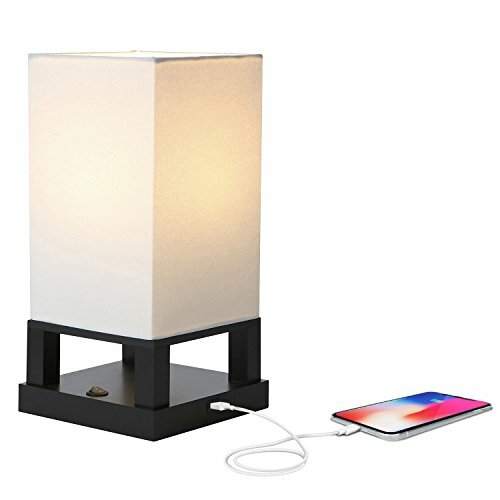 Save 11% on the Brightech Maxwell LED USB Side Table & Desk Lamp – Modern Asian Style Lamp with Wood Frame & Soft, Ambient Lighting Perfect for Living Room Bedside Nightstand Light- Energy Efficient - Black by Brightech at F LED Lights. MPN: MXWLL-TL-LED-BK. Hurry! Limited time offer. Offer valid only while supplies last. Designer Home Accessories At A Great Low Price Maxwell's shaded light provides a practical solution to harsh, inconsistent overhead light fixtures. Maxwell's shaded light provides a practical solution to harsh, inconsistent overhead light fixtures. The Maxwell USB Table Lamp brightly illuminates home, apartment, dorm, and other spaces used for working, studying, or living without glare. The neutral textured cloth shade conceals the included LED bulb on all sides except the top to provide perfect lighting for reading, spending time on social media, or relaxing. for a mirrored lighting effect. An accent lamp intended for use within intimate spaces, this wooden-base structure complements minimalist décor schemes with a Danish or Japanese influence. Base and shade measure 7" across, with a total height of 14". The built-in USB port located on the wood base features an output of 5V DC Max at 1 Amp to add practical convenience. Easily charge a tablet, phone, Playstation accessory, iPod, iPad, bluetooth speaker, or other electronic device, the open base has a small shelf to leave the device on as it recharges. An easy switch powers Maxwell on and off. The cord reaches approximately 4 ½ feet. Maxwell includes Brightech's energy-saving LightPro LED Bulb, which draws a mere 9.5 watts and fits in a standard E26 base socket. This long-lasting 800 Lumen LED bulb has a 3,000 Kelvin color temperature while glowing warm and bright without generating heat the way incandescent bulbs do. Inside, you'll find your new lamp in a protective cardboard insert, diagrammed step-by-step instructions for assembly (no tools required), and the LightPro LED bulb in its own packaging. Remove cellophane from shade and base, remove socket ring from the metal beams at the shade bottom, then simply follow the remaining steps to assemble, and enjoy basking in the beautiful diffused light of the Maxwell table lamp. CONVENIENTLY CHARGE YOUR ELECTRONIC DEVICES: This decorative table lamp contains a USB port so that you can charge your mobile phone, tablet, kindle reader, and other small electronic devices. It's also the perfect solution for portable speakers, radios, CD players, or MP3 docking stations. The convenience of this floor lamp makes it perfect for your home or office. UNIQUE MODERN STYLE WITH FUNCTIONAL DESIGN: The Maxwell Side Table & Desk Lamp combines modern looks with contemporary conveniences made possible by Brightech engineering! This lamp is wall switch and smart outlet compatible with Alexa, Echo, Dot, Google Home, etc so that you can turn the lights on and off with your voice or the simple flick of a switch as you enter the room. This modern Asian style lamp has many convenient modern features and looks beautiful in any contemporary home or office. BEAUTIFUL GLOWING WARM LIGHT: The Maxwell side table lamp features a Japanese style off white shade that opens at the top to soften brightness and filter light into a diffused glow through its translucent panels. Diffused shaded light provides an easy-on-the-eyes solution to the harsh brightness of traditional light fixtures so that you can feel calm and relaxed in your space. The Maxwell side table lamp sheds beautiful light that will add a warm tone to the décor and style of any room. LONG LASTING & ENERGY SAVING INDOOR LAMP: This lamp includes a 9.5 Watt power saving LED light so that you will never have to replace a bulb. It's advanced 3,000K warm white LED technology with 800 lumens allows it lamp to outshine lamps that depend on short lived, energy consuming standard halogen or incandescent bulbs. This LED lighting will endure for more than 20 years without burning out or overheating. Save money and energy with the Maxwell LED USB Floor Lamp. Max Wattage 60 W CFL.